Until tonight, I have not brewed a Mr. Beer batch of beer in awhile. According to my records, I brewed "Eric's Red" on 12/21/2010 (see Brewing Eric's Red). I kept telling myself that I'm going to brew something with the HME's / UME's that I got Peter after GABF, but I just have not done it (until tonight). Looking through ingredients in stock at the SheppyBrew nano-brewery, I had some Mr. Beer Classic American Blonde Ale HME and some Mr. Beer Pale Export UME. 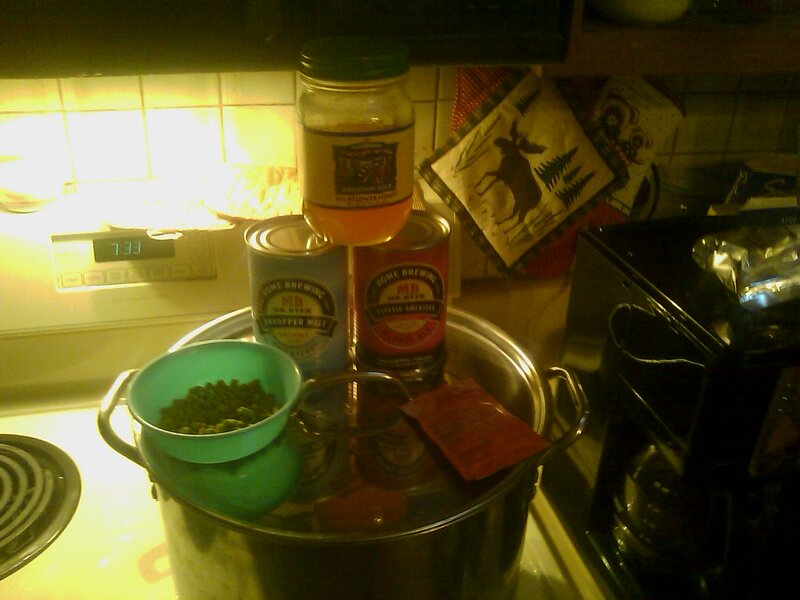 I also had some East Kent Goldings hops, some SafeAle American Ale (US05), and some honey. It just so happens that those ingredients are all I need to make my Wetta Blonde Ale. So, I decided to brew up some Wetta Blonde. My Wetta Blonde Ale actually has a story behind it. Once upon a time, a boy got a Mr. Beer kit for Christmas. His first batch was the Classic American Blonde Ale that came with the kit. He tasted it and it was good. He let other people taste it and they said it was good too. In fact, much to his chagrin, early on, the CABA seemed to be everyone else's favorite beer that he brewed. The spring break after beginning to brew, he drove his family to visit the in-laws in Henderson, NV. He brought a few of his beers with him (see Beer Tasting) and had a little tasting party with his mother-and-father-in-law, his cousin-in-law, and his the wife of the cousin-in-law. Of course the CABA was the favorite of this group. The boy's mother-in-law seemed especially excited about it. 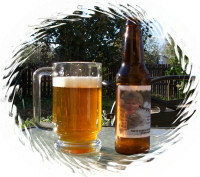 At some point during the evening, the boy promised to brew a beer "in honor" of his mother-in-law. The mother-in-laws nick-name is Huera, which usually (especially after the speaker and/or listener is a gringo and has been drinking) sounds like it is pronounced "wetta". Therefore, the boy decided to call the beer "Wetta Blonde". That is more-or-less the story. I didn't say it was particularly entertaining. Wetta Blonde is pretty simple. Tonight, I boiled 1 gallon of water with 1 can of Mr. Beer's Pale UME (unhopped malt extract). Once this is boiling, I added a quarter of an ounce of East Kent Goldings hops. I set the timer for 20 minutes. At about 10 minutes I added some yeast nutrient. A little after that, I added 8 ounces of honey. With 1 minute on the timer, I added another quarter of an ounce of EKG hops. Then, when the timer goes off, I remove the pot from the heat and add in a can of Classic American Blonde hopped malt extract (HME). I cool the pot in an ice bath for awhile. Then, I pour the wort into a Mr. Beer fermenter and fill up to about 2.25 gallons. I pitch in my yeast and then let it go to work. In a couple weeks, I'll bottle. In a couple more weeks, I will have about a case of beer to drink. Much simpler than my regular all-grain brew day. It is sort of relaxing to spend an hour instead of half a day. My pitching temperature was about 65F (perfect). My measured OG was at 1.051 (close enough to my 1.049 for me to be happy). I am looking forward to drinking this. I may even let my mother-in-law have some of this batch. I think she is coming sometime in September. There is some exciting news about one of my virtual brewing-buddies. Eric G, former brew-master at Mr. Beer has left his position to start a brew-pub in Tuscan Arizona (Dragoon Brewing Company). 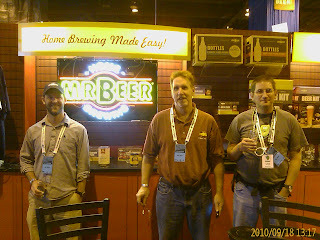 Eric is one of my few virtual brewing friends that I've actually met in person. He, of course, was the one who got me GABF tickets and allowed me to hang out at the Mr. Beer booth last year (see GABF Final Session and Random Thoughts and the various links from that page). He is also the one who named me "Brewer of the Month". I owe a lot of my brewing knowledge to things Eric has posted on the Mr. Beer forum and I think he is easily the most knowledgeable home-brewer I've ever talked to in person. I am absolutely sure he will make a great professional brewer and the beer at Dragoon Brewing Company will be absolutely fantastic. If I'm ever in the Tuscon area, I will be sure to make a trip to Eric's brew-pub a top priority. Eric is on the left.